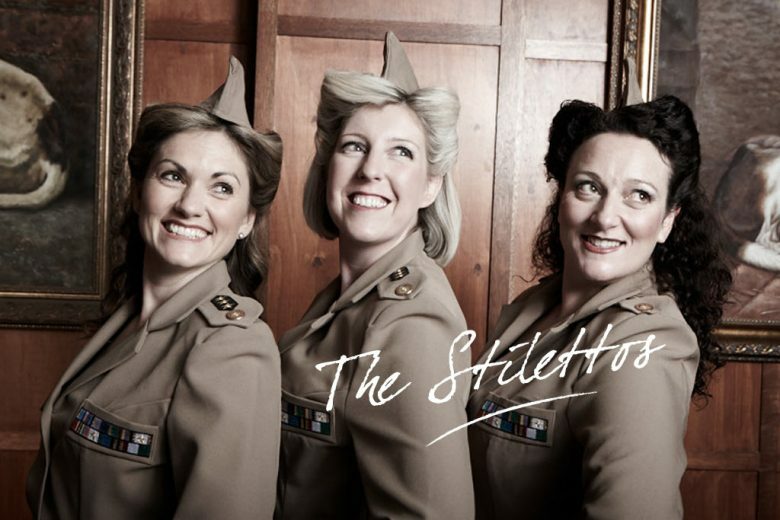 The Stilettos are a professional Australian female vocal trio based in Canberra. The group perform well-known and loved songs from a variety of eras, and deliver a professional, enthusiastic and captivating performance complete with chorography and full show costume. They shared their story with us. How did you get together as a group? Tina: I was running my own talent agency business and through that became familiar with many of the entertainers in the Canberra region. Once my children were at an age where I was ready to perform and rehearse regularly again, I started pursuing my vision of putting together a professional vocal trio, and contacted Sally to see if she would consider joining. At that point, we’d never actually met (or even heard each other perform live! ), but I had listened to a recording of Sally’s voice and thought she would be perfect for the trio. Sally and I organised a meeting, and when we sang together for the first time there was an instant connection and great sound. So we started arranging auditions to find a suitable third member/alto. At the auditions, we originally chose a performer by the name of Mel, however she was unable to commit to The Stilettos. We then approached Janie to see if she would consider joining the group, and fortunately she accepted! We’ve now been performing together as a trio since September 2010. Tina: As a group we are inspired by close harmony singers – trios such as The Andrews Sisters and The Puppini Sisters. I’m also inspired by entrepreneurs and those who can take a great idea and execute it, particularly when they have had to overcome obstacles to achieve their goal. As a performer I am inspired by Bette Midler. She is brilliant at connecting with an audience and incorporates humour and personality into her live performances. I also find Sir Elton John incredibly inspiring. His longevity in the music industry is testament of his talent and professionalism. And of course, my family is a constant source of inspiration. Janie: My partner Gary and 10 year old twin girls Ashleigh and Bianca are my biggest inspiration in life. They inspire me to always put my heart into everything I do! Sally: I am inspired by entertainers who are crusaders and use their profile to share important messages or support a cause. You perform songs from different eras. What’s your favourite? Tina: We all agree that performing the music of the swing era is our favourite. We particularly love performing the Andrews Sisters because of the rich sound that results from the tight vocal harmonies. How have your careers changed since having children? Tina: My career has changed completely since having children. Prior to kids I always worked for someone else (I was in property sales/marketing and was also a performer at a theatre restaurant). After children, I created my own work – I started a talent booking agency, created The Stilettos and now also freelance as an actor in TV commercials. I have my children to thank for giving me the opportunity and courage to create a different and more flexible career path. Janie: I put my career on hold for about a year after my children were born and then I worked part time when they were toddlers. I can honestly say that my career destination has not really changed, I just followed a few rocky goat tracks along the way! Sally: Prior to having children I was working as a full time physiotherapist. After children, singing became my dominant career path. How do you balance your work with your families? Tina: As a group, we always try and plan ahead. We seem to thrive on deadlines as this helps us work to a plan. Great communication and preparation ensures that both our family and work commitments can be organised. In my own household we have a family day every week where we don’t do anything during that time that is work related. We switch off the phones and hang out with the kids. We find time to focus on each other without distractions. My hubby and I also organise a regular date to catch up for a chat and a laugh. Sharing the domestic workload and having a supportive partner and family is also paramount to achieving balance. Janie: With 10 year old twin daughters, routine has always been critical in my house from the day they were born. Without it, every part of our lives can get out of control! I have always had incredible family support, and my partner Gary and I have always shared the parenting and household duties in our house. I also have an amazingly supportive mother and step father, who are very involved in my children’s lives. They are always there for us at the drop of hat. I am so lucky, there is no way I could do what I do without my family! Sally: It’s about reaching a compromise with your partner and family where everyone’s needs are satisfied. What tips would you share with other working mums? Tina: Be selective with your time. Define your boundaries so that you can maintain balance. If you consider taking on extra work beyond those boundaries, question how you and your family will benefit. As a working mum you have to juggle so much already. Don’t let other people’s expectations take control of your schedule. It’s also very important to love what you do as this keeps you motivated through any tough times. Janie: Routine is key. Set times for dinner, settling and bed. Kids thrive on it, though they won’t admit it! I also think that it is important to be true to yourself and keep your own passions alive. Although it can be hard you must continue to do whatever it is that makes you feel alive, whether that is sport, music, dancing etc. Your family will benefit from a fulfilled, happy you! Sally: Slow down. Don’t try and do too much. Enjoy the time you have with your children. What’s your vision for The Stilettos in five years? Tina: We want to continue growing as a group; to be continually working on new and fresh material, bringing an old world twist to modern songs. We have also had discussions about branching into musical comedy so it’s very likely that we will also be recognised for our humour in addition to our harmonies. An overseas tour would be nice too! You can find out more about The Stilettos, watch their showreel and find out how to get in touch with them on their website. You can also connect with them on Twitter.